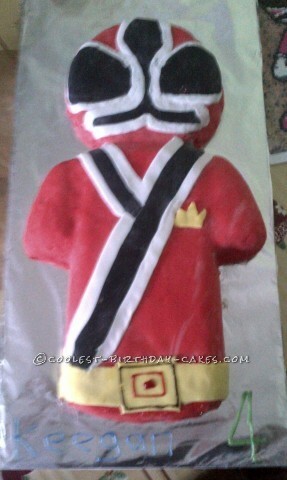 This fab Red Samuria Power Ranger birthday cake is the hardest thing I have ever made but I had to try. I spent three nervous weeks preparing myself for the task, as firstly I had never made Madeira cake before and secondly I had never made a proper birthday cake before. It was made for my son’s 4th birthday and was sufficient for 30 – 40 people. Firstly I used a 12″ t-shirt cake for the body, so I used double ingredients then I made the head in a 7″ round tin just using normal amount of ingredients. I then used 750g of red icing to completely cover the head and body before using black,white and yellow for the design. All together it took me 3 hours over two days as I made the cake the day before using so it had time to settle. Result: fab tasting, looked amazing and lots of comments from mum’s at the party, maybe a few orders to follow! !